Mozilla Service Week: How to help! 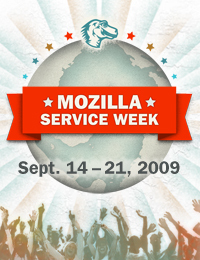 Wondering how you can get a head start on Mozilla Service Week (Sept. 7 – 21, 2009)? You can roll up your sleeves and help an organization in need of technology-related service now or help get the word out! This summer it will be critical to not only expose Mozilla Service Week to would-be volunteers worldwide, but help identify and approach non-profits or local organizations that can use our help. Download site badges, banners, and buttons to add to your blog, your social network profile, or your email signature. Download a Mozilla Service Week flyer. Print it out and hand it out at a local event or post at work, at school, or at your community center. Start planning your service activity and challenge your friends to join you using PledgeBank. Get the word out by posting news, video or pictures on your blog, twitter, or social network site. Tag your posts with “mozservice09” so they’re easy to find. Share your story of what you’re planning to do for Mozilla Service Week here or on your favorite social networking site. Flaunt your support for Mozilla Service Week with a customized Persona, a skin for Firefox. Everyone should have the opportunity to know how to use the Internet, have easy access to it, and have a good experience when they’re online. So if you have a talent for writing, designing, programming, developing, all-around technical know-how or a knack for spreading the word, join the Mozilla Service Week effort today.